16 May 2012: I was awarded the title "Honorary Professor" by the University of Music and performing Arts in Munich! 22 January 2010: G-Strain had a great gig in the Kulturkeller in Feldafing! Check out the videos on YouTube here! 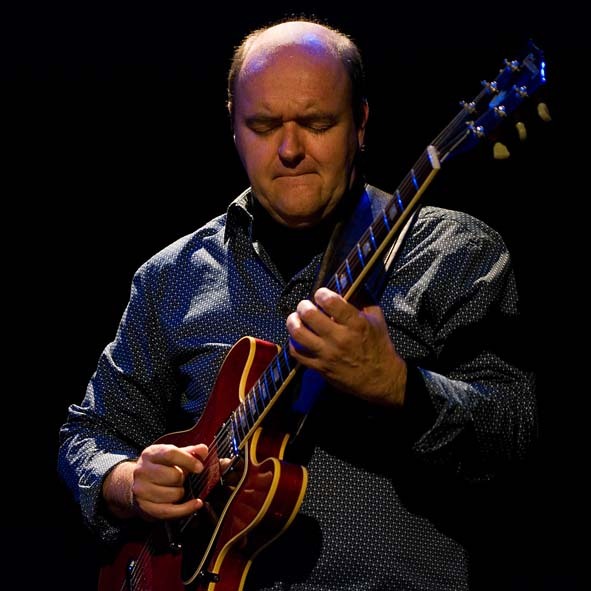 18 January 2010: The new video series "A Complete Concept for Jazz Guitar" is now available! This comprehensive series of videos cover all aspects of learning how to play jazz guitar. More information here! 5 December 2009 was one of the best gigs of my musical career! We had the pleasure to play at the Jazzkeller in Miltach, which is in my opinion the best Jazzclub in Germany. There was a fantastic audience and also club owner Alois "Boda" Breu and his wonderful wife. After the gig we were able to enjoy the delicious beer and food that Boda had to offer. A jazz musician´s "heaven" if there ever was one! The new CD from O´Mara Hornek Scales Lettner "ACENTRIC" is now available on Marangani Records! You can listen and become a friend at our MySpace site! The PO´M 50th birthday concerts in Bamberg & Munich were very emotional experiences. Thank you for supporting my music! The previously released CD´s "Avenue U", "Stairway" & "Symmetry" are now available in remastered versions on Marangani Records! Some CD´s are also available to download at the iTunes Music Store! YUMAG Live im Kongress CD released on Marangani Records! Trio O´Mara -Sieverts-May have recorded a new CD! Release date late 2007! Listen here! I finally got a "MySpace" site! Here it is... Check out the "Wang Thang" live video! Also a review of the "Ocean Suite" by Alexander Schmitz. I think he liked it! It´s nice to be appreciated by colleagues and students for the work you do! I just found this recording of "Oleo" from 1981 with Attila Zoller from a concert in Landshut in 1981. Attila was a great musician and friend. He changed my life.